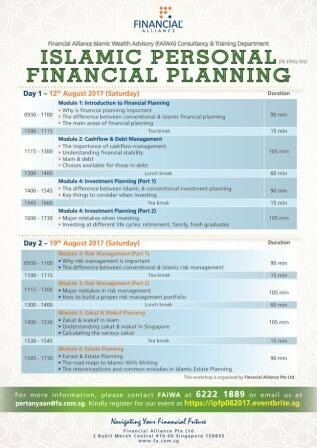 In each area, participants will gain the knowledge on key factors to understand from the Islamic perspectives and common mistakes to avoid. 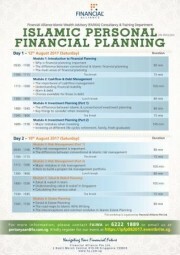 Participants who complete all 6 modules will be given a certificate of attendance. 12th August & 19th August 2017, 9.30am - 5.30pm on both dates. This Workshop is organised by Financial Alliance Pte Ltd. For more information, please contact FAiWA at 6222-1889 or email us at pertanyaan@fa.com.sg.